Photos are provided for the use of journalists; copyright is reserved by the photographer. Please credit photos with the actors who appear and the photographer. Contact idiotstring@gmail.com with questions or press inquiries; click for higher-resolution images. 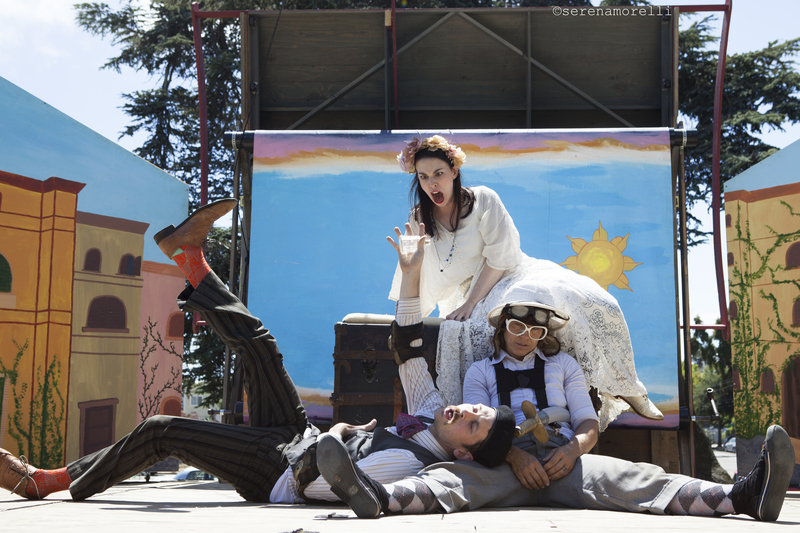 Guy Hank (Paul Collins) and Thumper (Joan Howard) as Pirates, and Samuel Peaches (Casey Robbins) as a tempting siren. Photo by Rebecca Longworth. 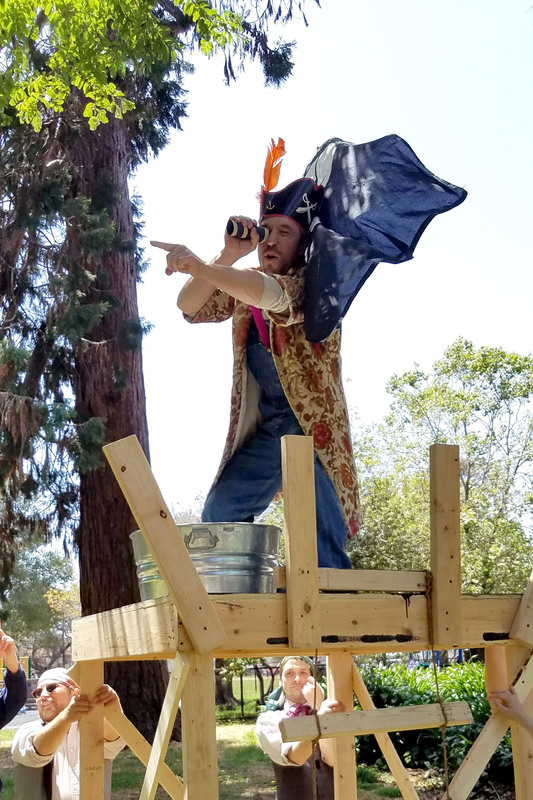 Guy Hank (Paul Collins) on lookout in a crow’s nest. Photo by Rebecca Longworth. 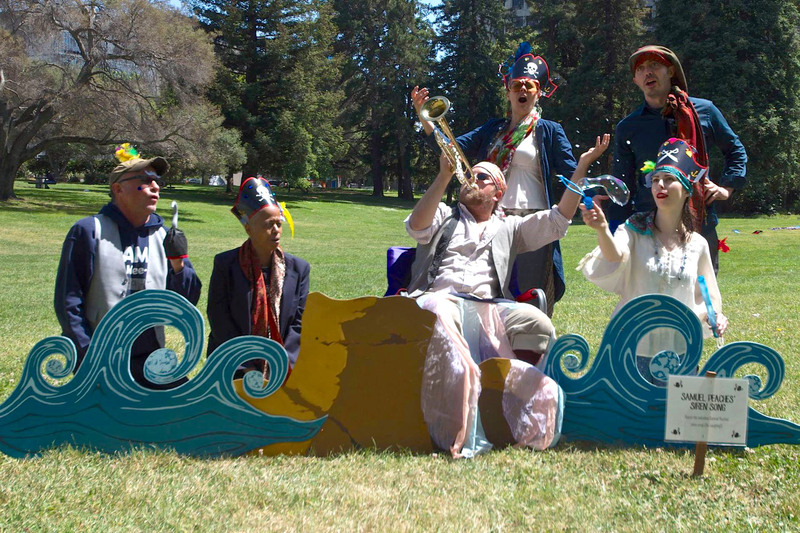 Audience members (far left and right) join Samuel Peaches (Casey Robbins, center with trumpet), Madame Directrix (Rebecca Longworth), and Princess Gwen (Marlene Yarosh) in a sea chantey. Photo by Tim Guydish. 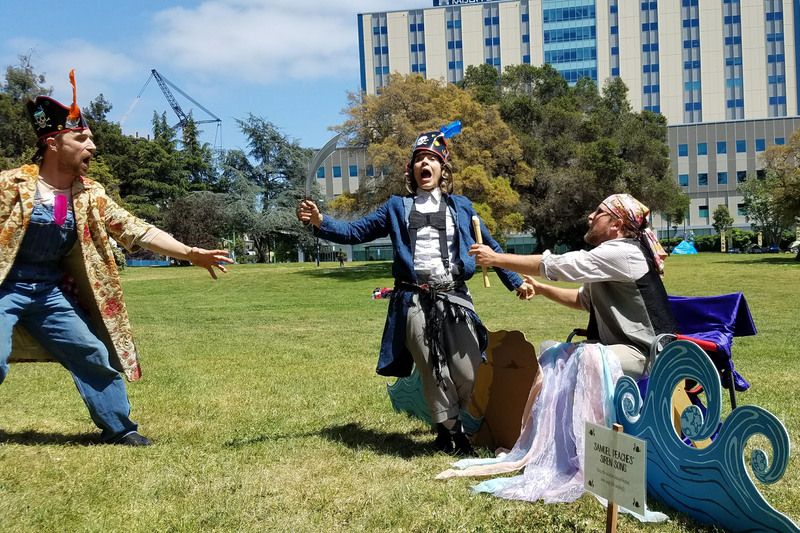 Percival Perkins (Soren Santos, l) and Meekins (Sam Bertken, r) provide waves as Madame Directrix (Rebecca Longworth, c) goes “surfing.” Photo by Tim Guydish. 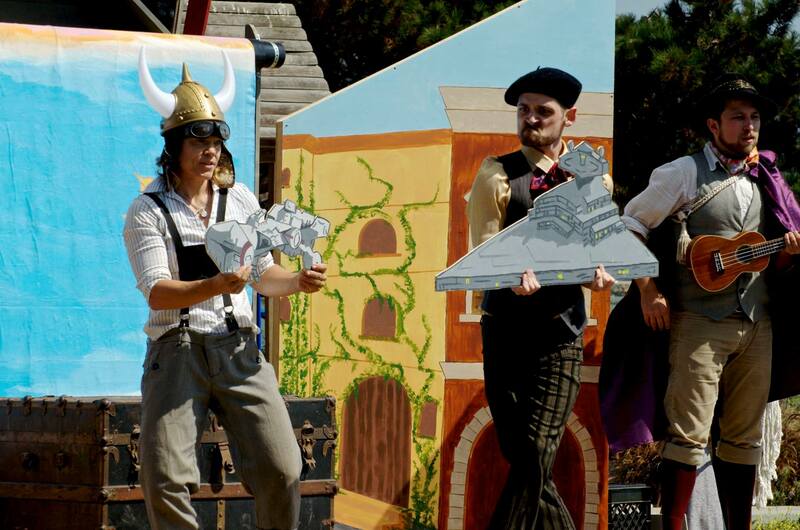 Thumper (Joan Howard) and Meekins (Sam Bertken) stage an intergalactic battle through the streets of Verona in Shakespeare or Space Wars. Photo by Tim Guydish. 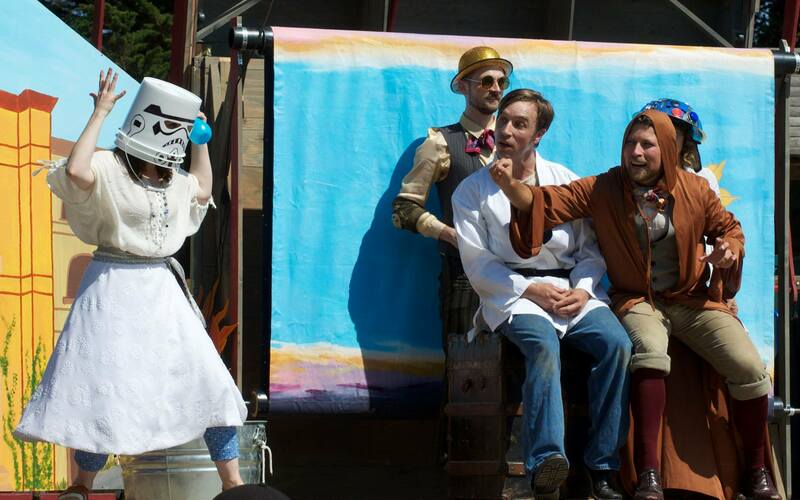 Samuel Peaches (Casey Robbins) as Obi-Wan Peachobi uses mind tricks to elude a Storm Trooper played by Princess Gwen (Marlene Yarosh). 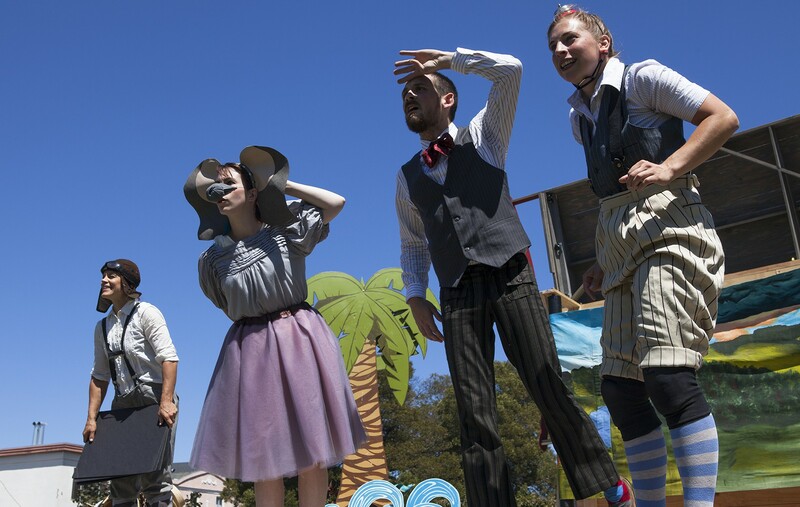 Guy Hank (Paul Collins), playing Lank Guywalker, watches in amazement. Photo by Tim Guydish. 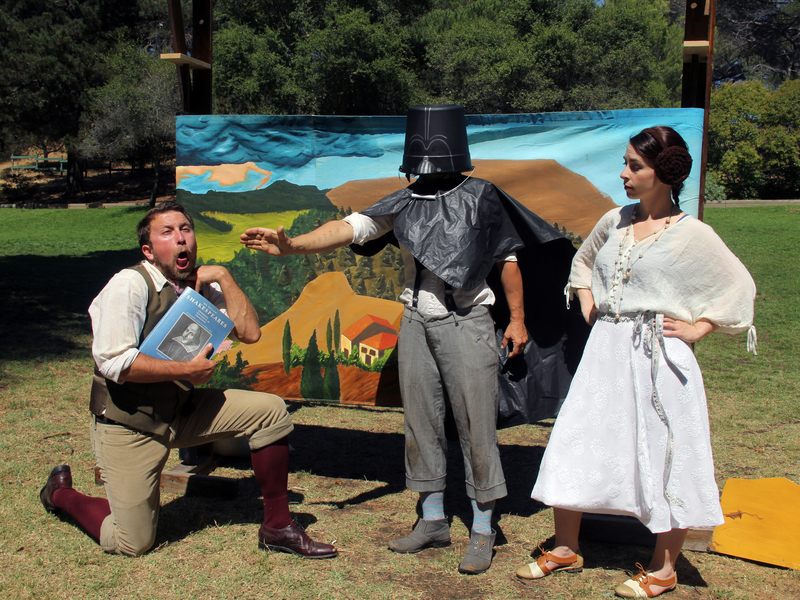 Samuel Peaches (Casey Robbins) plays Juliet’s Nurse in a scene from Shakespeare or Space Wars also featuring Princess Gwen (Marlene Yarosh) as Juliet and Guy Hank (Paul Collins) as Lady Capulet. Photo by Tim Guydish. 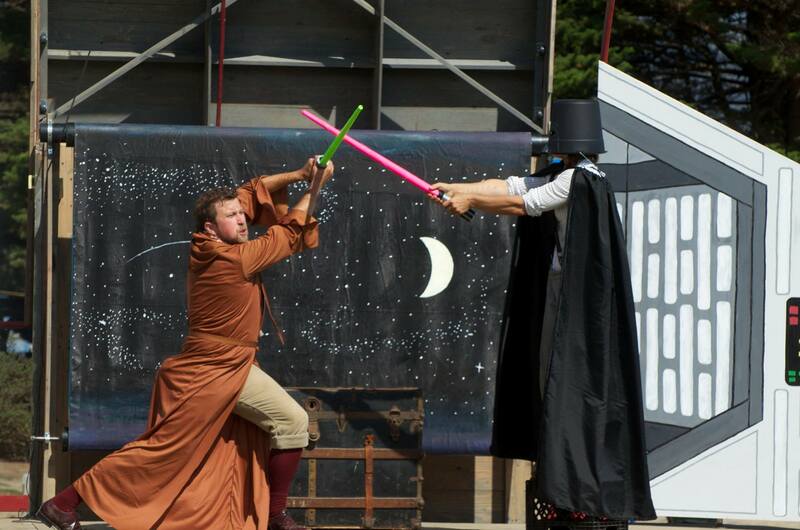 Obi-Wan Peachobi (Casey Robbins) faces off against Darth Thumper (Joan Howard) in Shakespeare or Space Wars. Photo by Tim Guydish. Samuel Peaches (Casey Robbins) pulls out all the emotional stops as the Nurse, who must discover the seemingly-deceased Juliet, played by Princess Gwen (Marlene Yarosh). Photo by Tim Guydish. 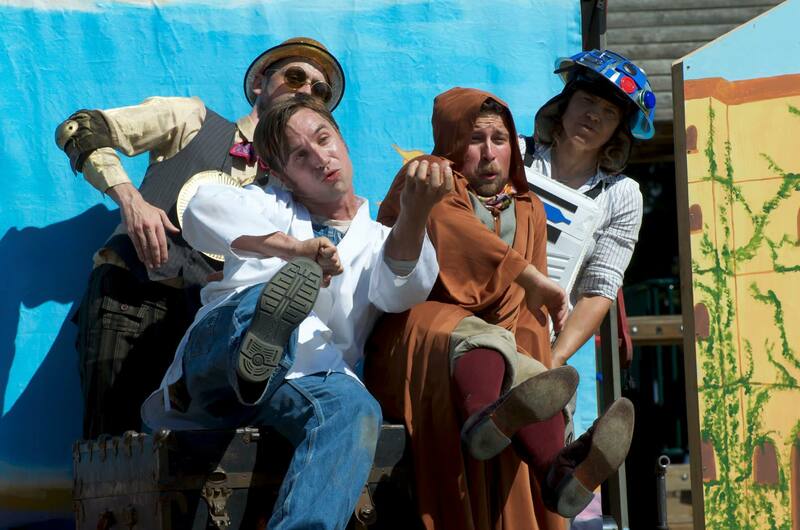 Meek3PO (Sam Bertken), Lank Guywalker (Paul Collins), Obi-Wan Peachobi (Casey Robbins) and Thump2D2 (Joan Howard) travel by pantomime in a scene from Shakespeare or Space Wars. Photo by Tim Guydish. 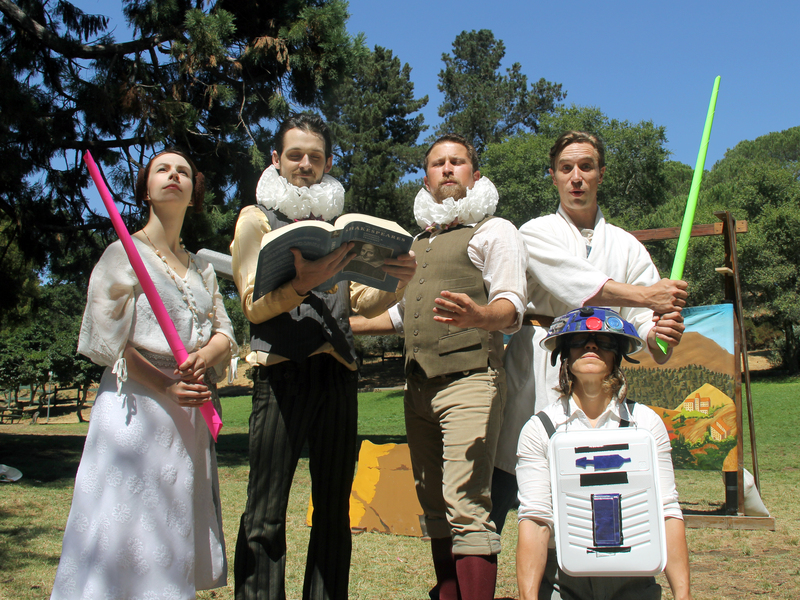 The Peripatetic Players enact a famous scene involving a trash compactor in Shakespeare or Space Wars. Photo by Tim Guydish. 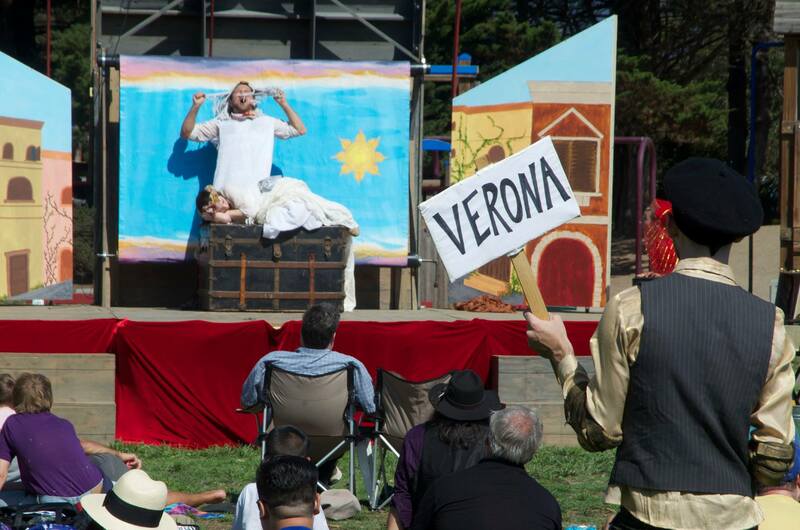 The Peripatetic Players in a Veronese scene from Shakespeare or Space Wars at the Berkeley Marina, September 2016. Photo by Rebecca Longworth. 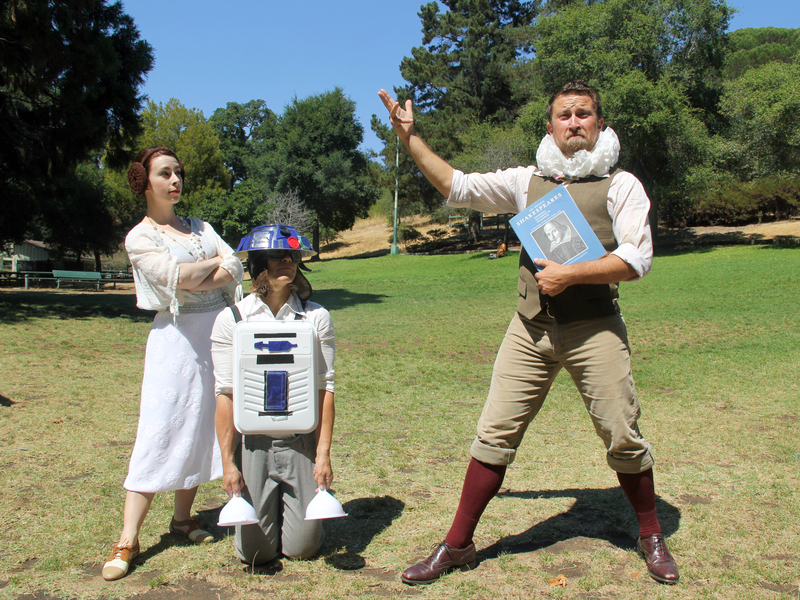 In their latest adventure, the Players inhabit two worlds: Princess Gwen (Marlene Yarosh), Guy Hank (Paul Collins) and Thumper (Joan Howard) are ready for their roles as Princess Gweia, Lank Guywalker and Thump2D2 in “Space Wars,” while Mr Peaches (Casey Robbins) and Meekins (Sam Bertken) rehearse their monologues for “Romeo and Juliet.” Photo by Rebecca Longworth. 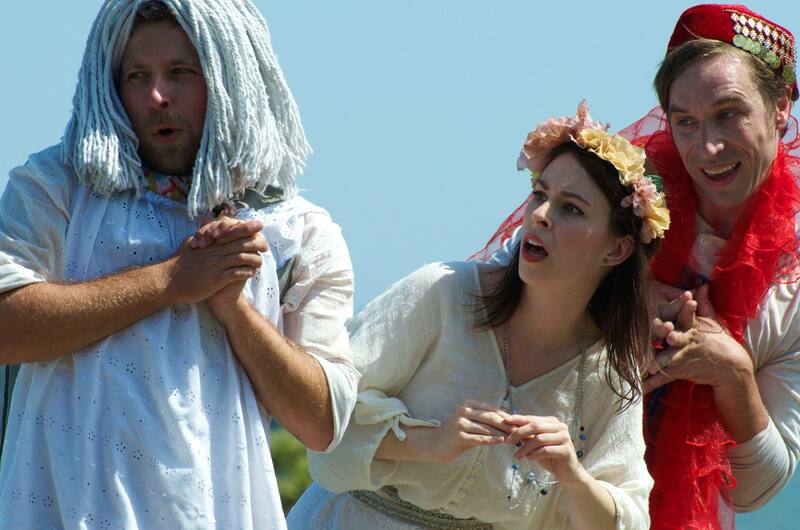 Samuel Peaches (Casey Robbins) feels the wrath of Darth Thumper (Joan Howard) as Princess Gweia (Marlene Yarosh) looks on. Photo by Rebecca Longworth. 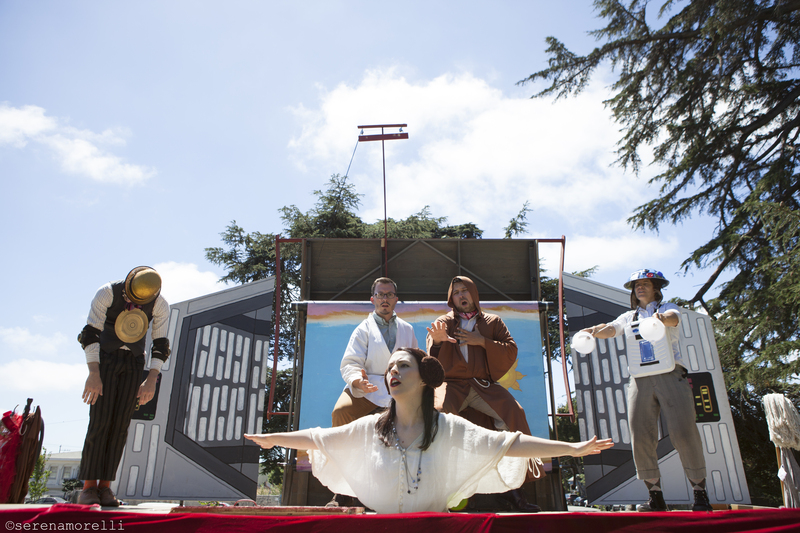 Princess Gwen as Princess Gweia (Marlene Yarosh) and Thumper as Thump2D2 (Joan Howard) listen to Samuel Peaches (Casey Robbins) pontificate about the genius of Shakespeare. Photo by Rebecca Longworth. 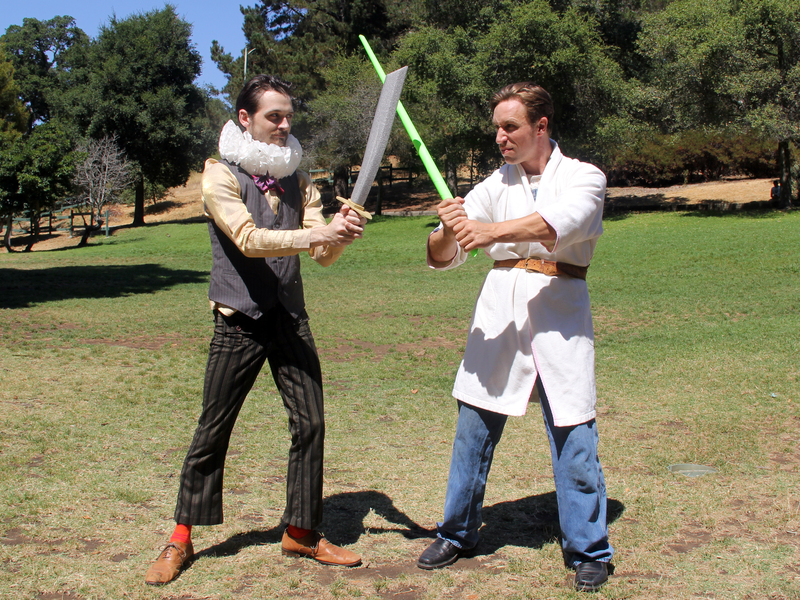 Meekins as Romeo (Sam Bertken) versus Guy Hank as Lank Guywalker (Paul Collins). Photo by Rebecca Longworth. 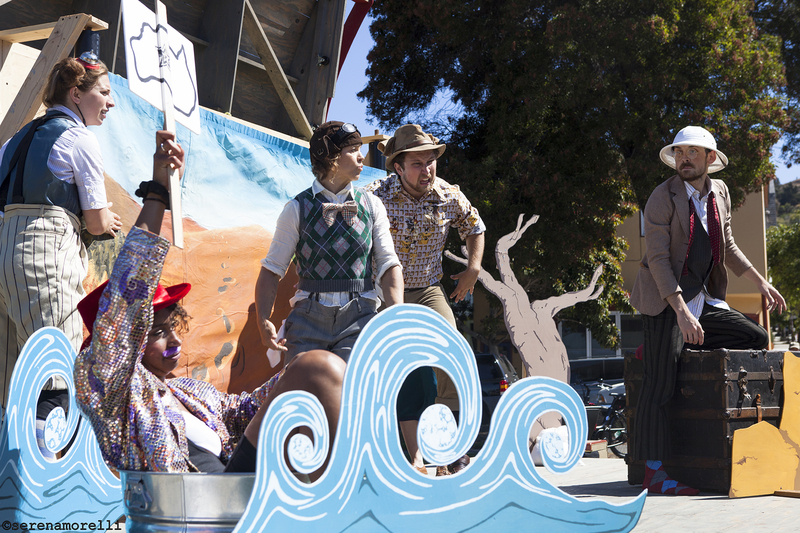 Frogs get more than they bargained for from a simple game of skipping stones in AESOP AMUCK. 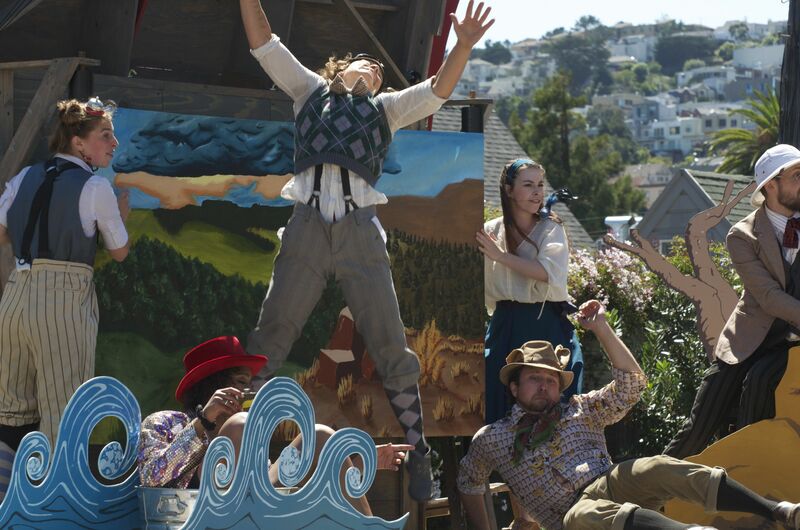 (From left: Joan Howard as Thumper, Paul Collins as Guy Hank, Marlene Yarosh as Princess Gwen, Sam Bertken as Meekins, Casey Robbins as Samuel Peaches, and several audience members at Noe Valley Town Square, August 2015.) Photo by Tim Guydish. 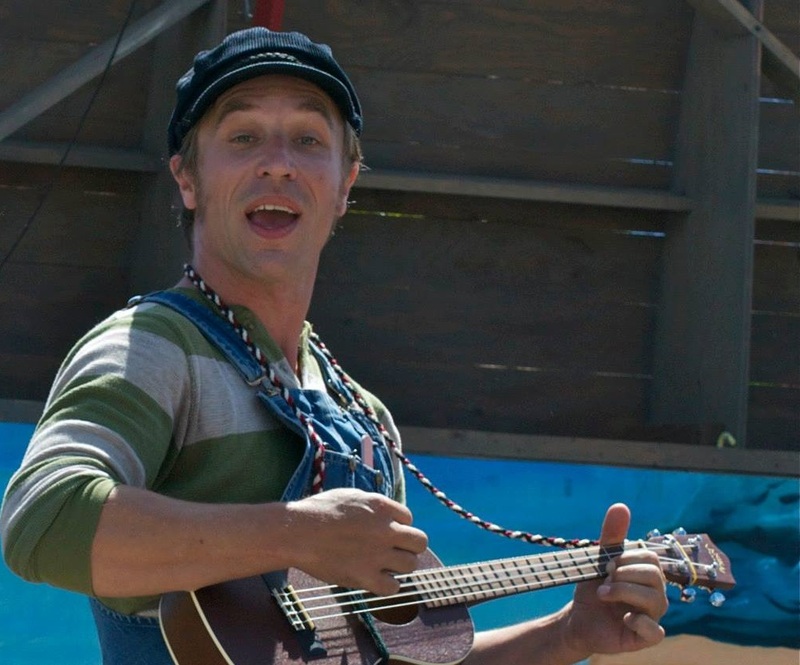 Paul Collins as Guy Hank in a musical moment from AESOP AMUCK. Photo by Tim Guydish. 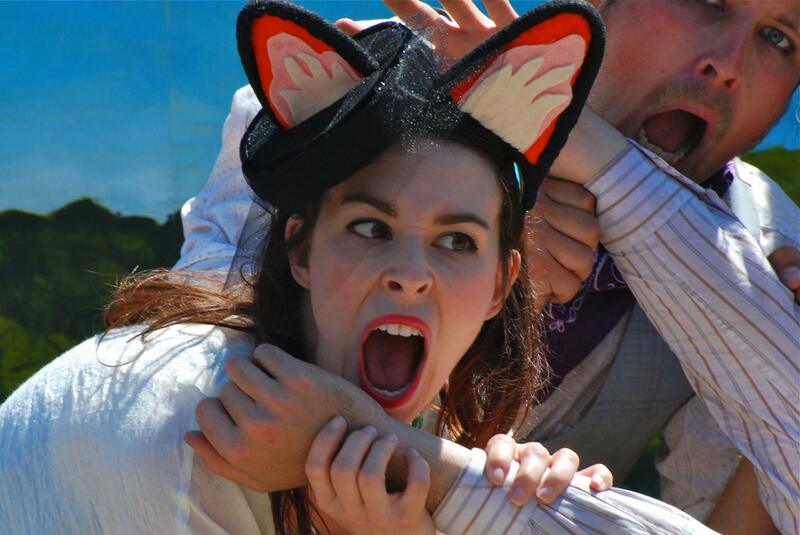 Marlene Yarosh as Princess Gwen as a hungry fox in AESOP AMUCK. Photo by Tim Guydish. 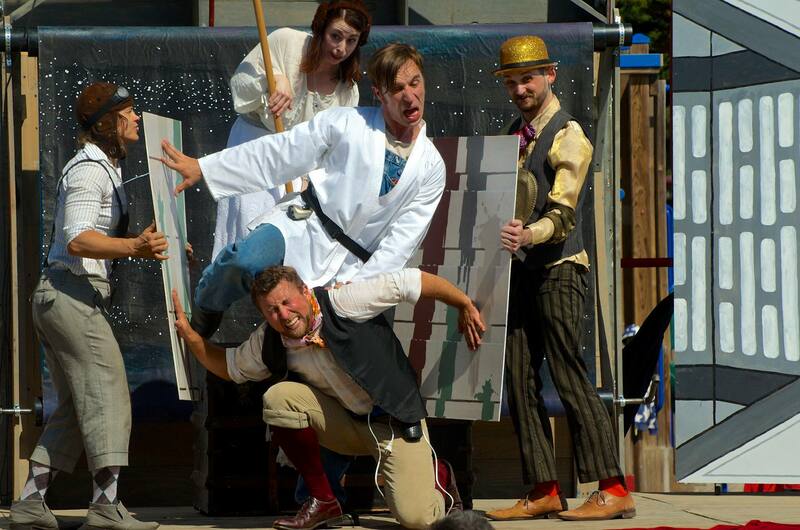 The Hare (Sam Bertken as Meekins) gets a running start against the Tortise (Paul Collins as Guy Hank) while two sportscasters (Casey Robbins as Samuel Peaches and Marlene Yarosh as Princess Gwen) give a play-by-play in AESOP AMUCK, August 2015. Photo by Tim Guydish. 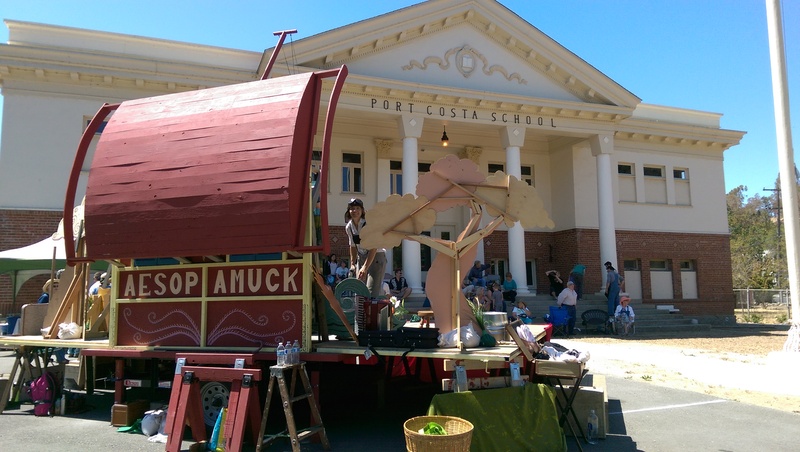 The Peripatetic Players’ Prop Master, Thumper (Joan Howard) sets up their stage, FluxWagon, in front of the Port Costa School House during the 2015 Bay Area tour of AESOP AMUCK. Photo by Rebecca Longworth. 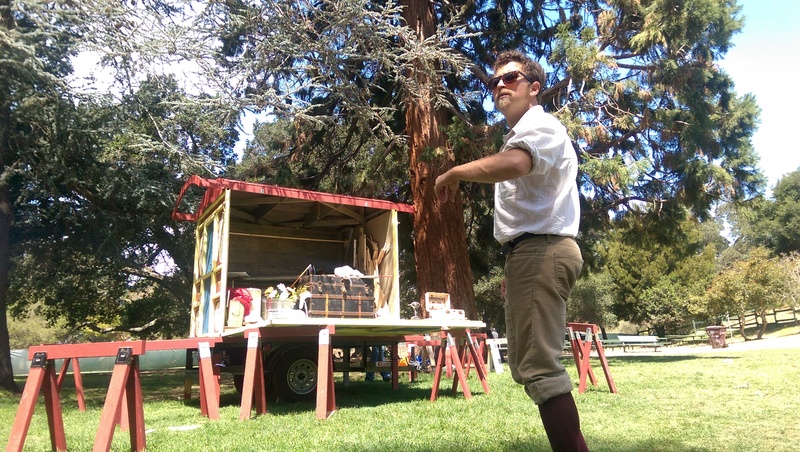 Impresario and artiste Samuel Peaches (Casey Robbins) oversees the arrival of FluxWagon at Dimond Park, Oakland, during the Peripatetic Players’ 2015 Bay Area Parks Tour. Photo by Rebecca Longworth. Thumper (Joan Howard) as Paris — a man of wax! 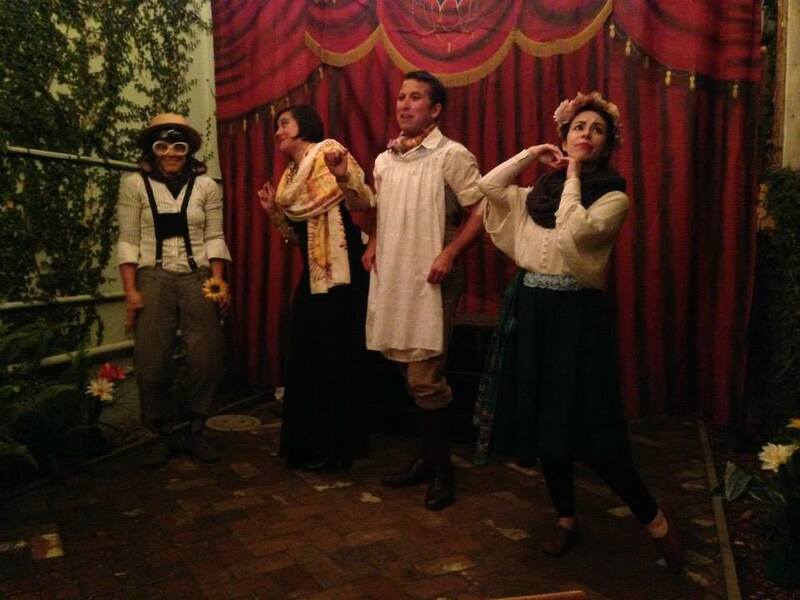 — with Madame Directrix (Rebecca Longworth) as Lady Capulet and Samuel Peaches (Casey Robbins) as the Nurse, discussing the nuptial fates of Princess Gwen (Marlene Yarosh) as Juliet in the Peripatetic Players’ 2015 spontaneous adaptation of Romeo and Juliet at Port Costa’s Bull Valley Roadhouse. Photo by Danielle Gray. 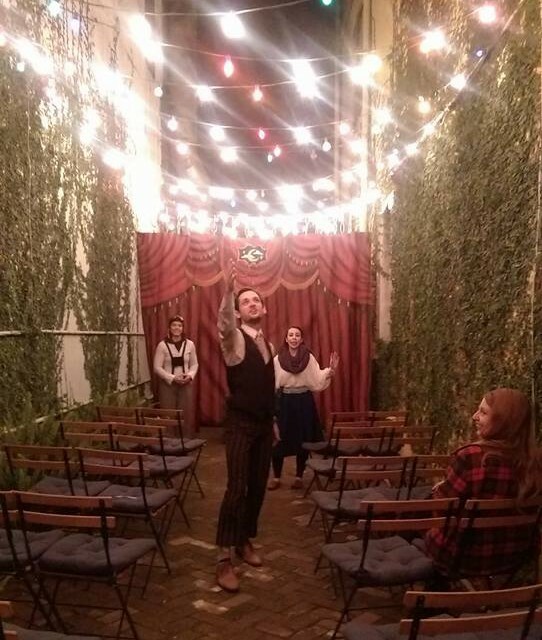 Mr Meekins (Sam Berten) warms up for what will be, unbeknownst to him, a stunning turn as the young lover Romeo in the Peripatetic Players’ 2015 spontaneous adaptation of Romeo and Juliet at Port Costa’s Bull Valley Roadhouse. 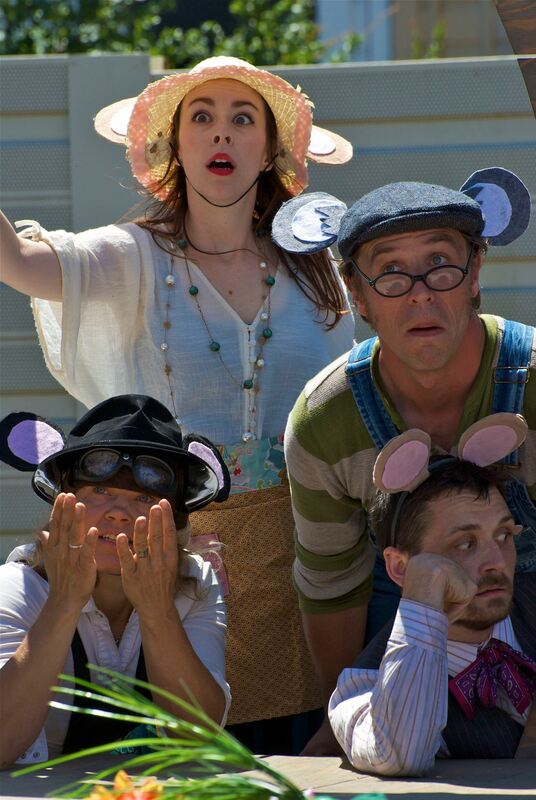 Thumper (Joan Howard) and Princess Gwen (Marlene Yarosh) look on. Photo by Rebecca Longworth. 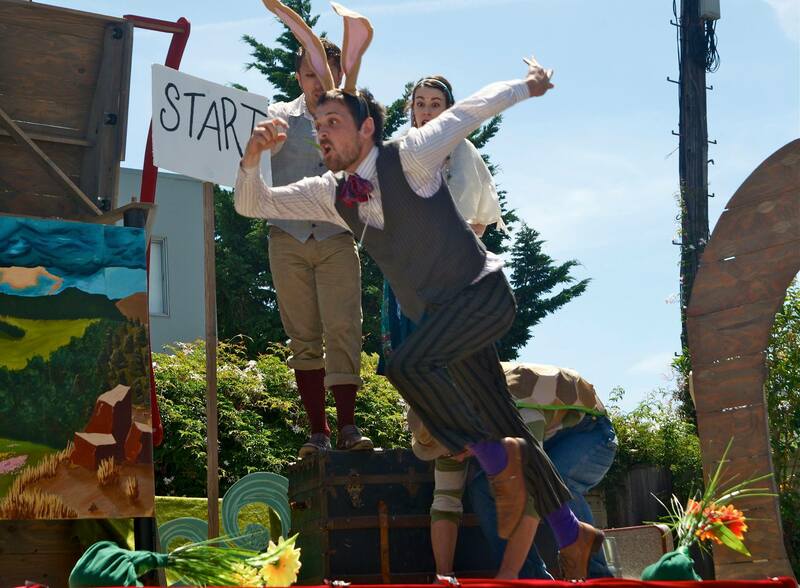 Thumper (Joan Howard) jumps high to escape the Dingo, played by Samuel Peaches (Casey Robbins), in O BEST BELOVED at Noe Valley, August 2014. Photo by Tim Guydish. 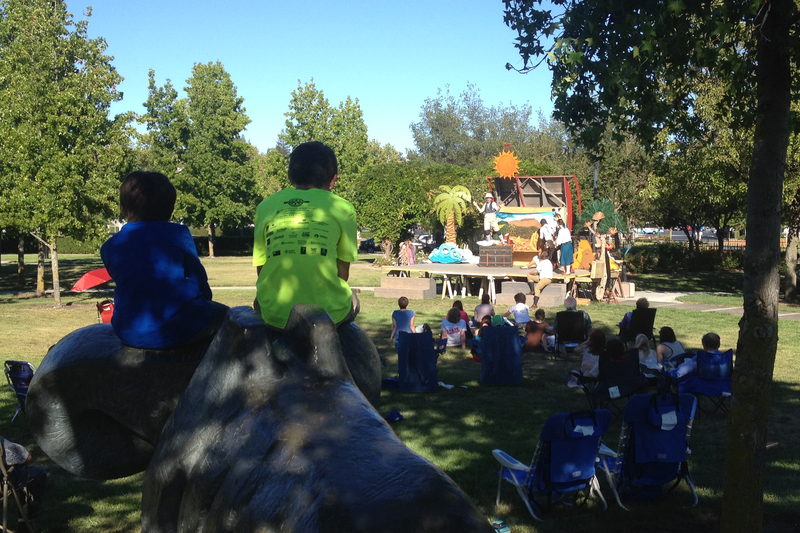 O BEST BELOVED at Centennial Park, Pleasanton, August 2014. Photo by Rebecca Longworth. 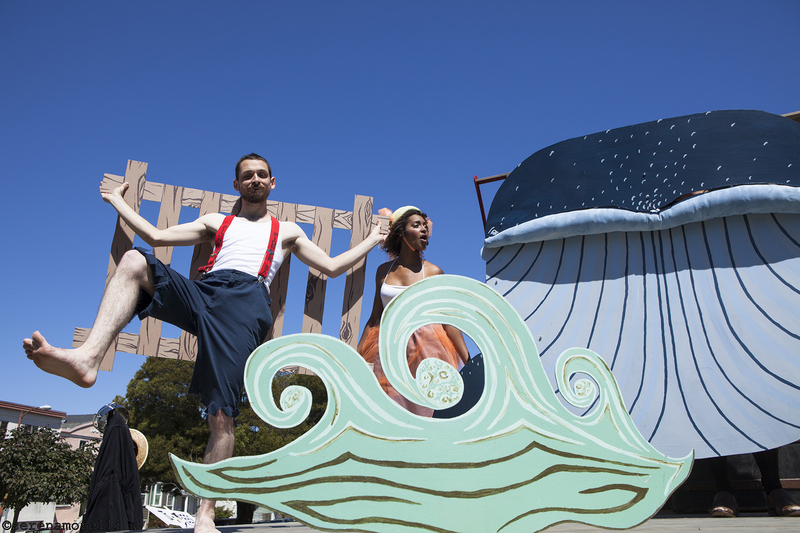 A Mariner (Sam Bertken as Meekins), Stute Fish (Sam Jackson as Blueberry Starshine) and Whale (designed by Megan Hillard) in O BEST BELOVED, August 2014. 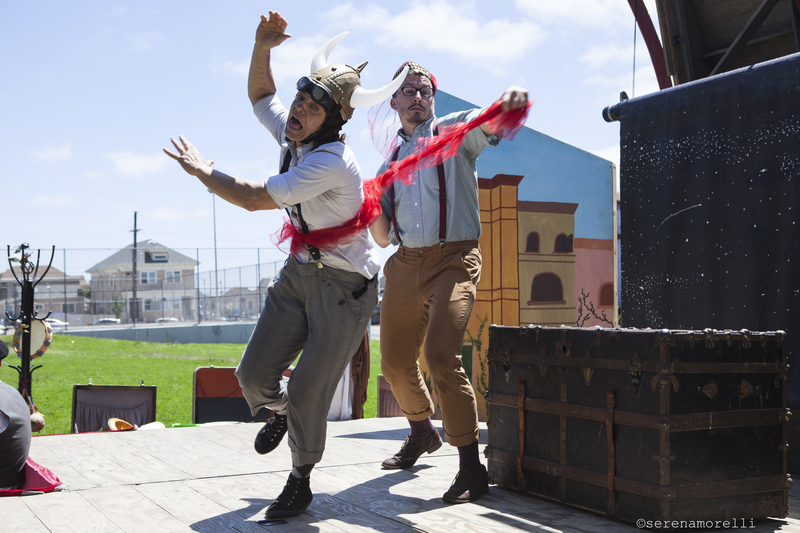 Photo by Serena Morelli. 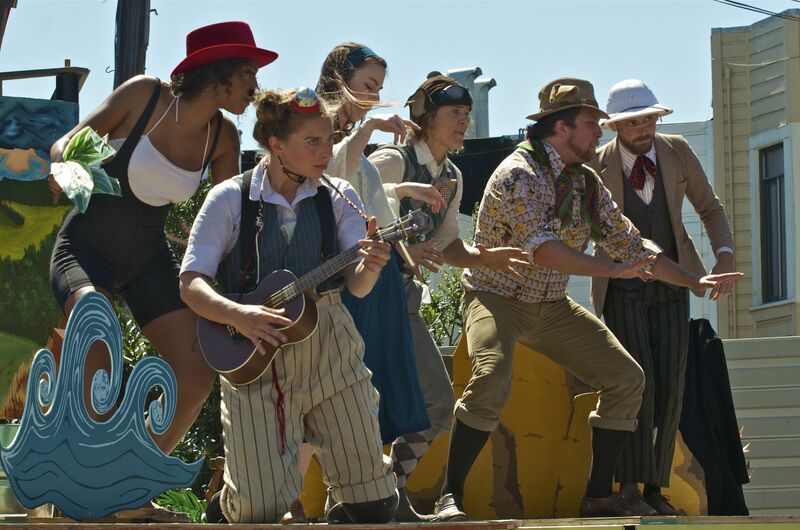 The Samuel Peaches Peripatetic Players in O BEST BELOVED at Noe Valley Town Square, August 2014. Photo by Tim Guydish. 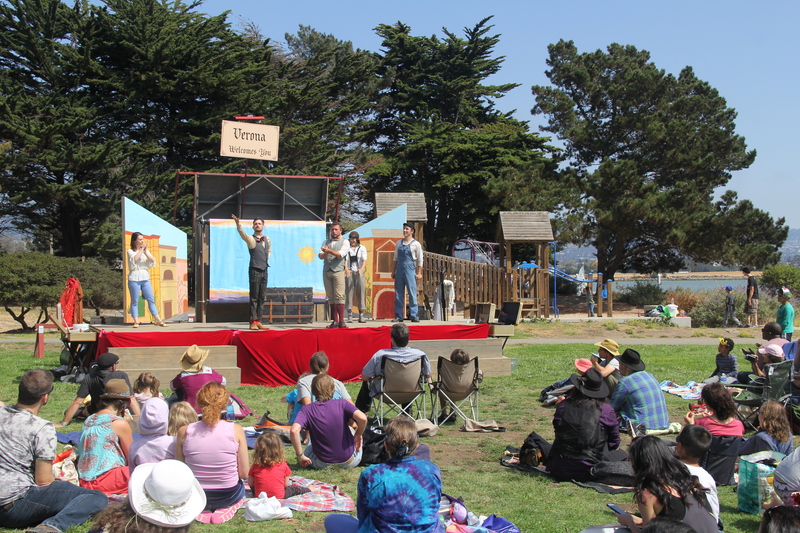 Thumper (Joan Howard), Princess Gwen (Marlene Yarosh), Meekins (Sam Bertken) and Arby Darby (Juliana Frick) in O BEST BELOVED at Precita Park, San Francisco, August 2014. 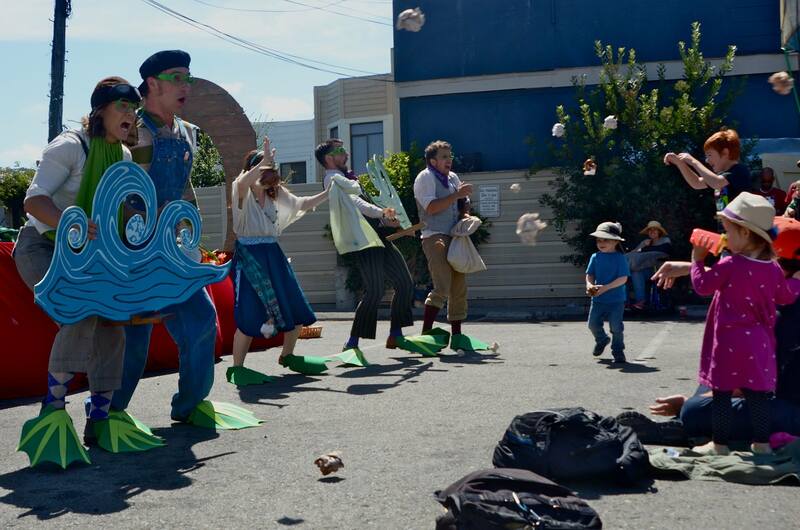 Photo by Serena Morelli. 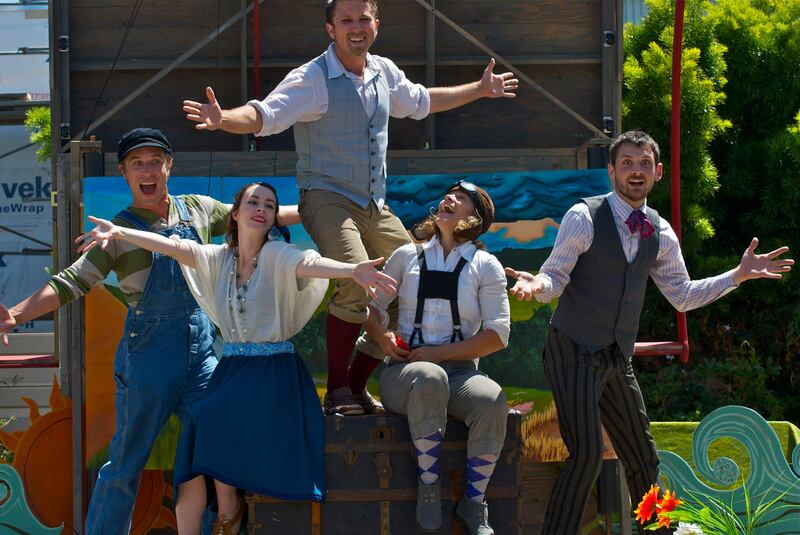 The Samuel Peaches Peripatetic Players in O BEST BELOVED, August 2014. 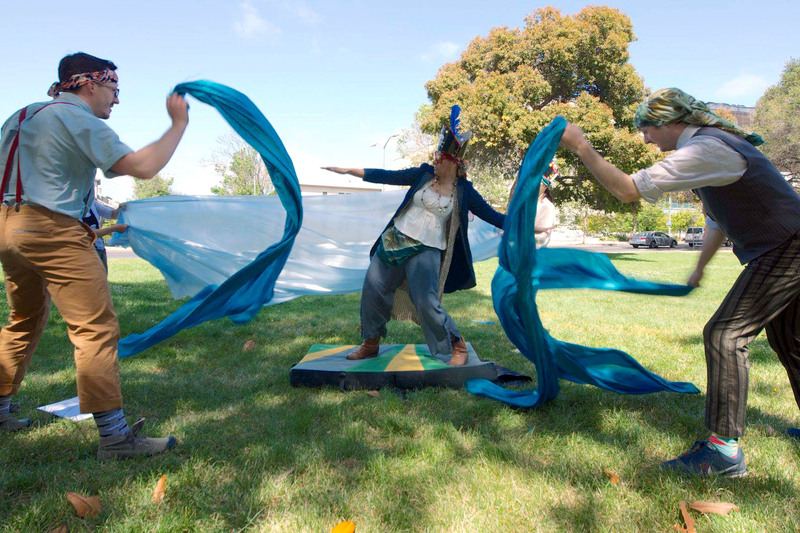 Photo by Serena Morelli. 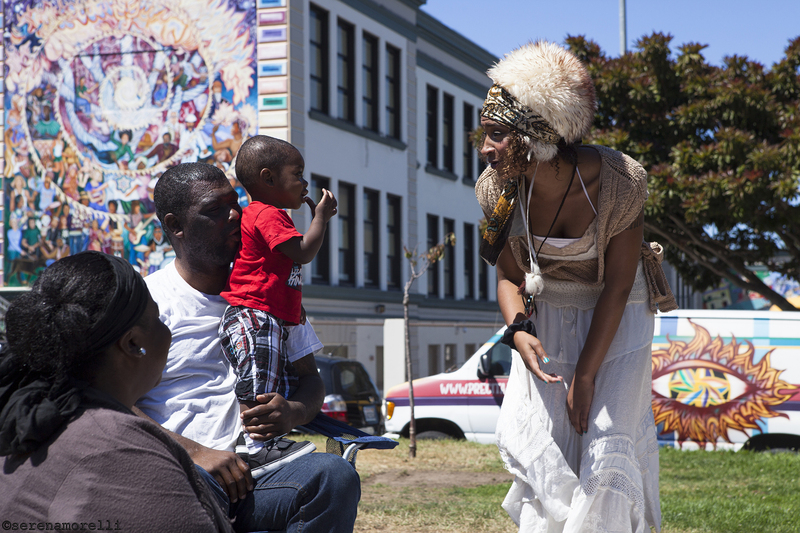 Player Emeritus, Blueberry Starshine (Sam Jackson), with some audience members at Precita Park, San Francisco, August 2014. 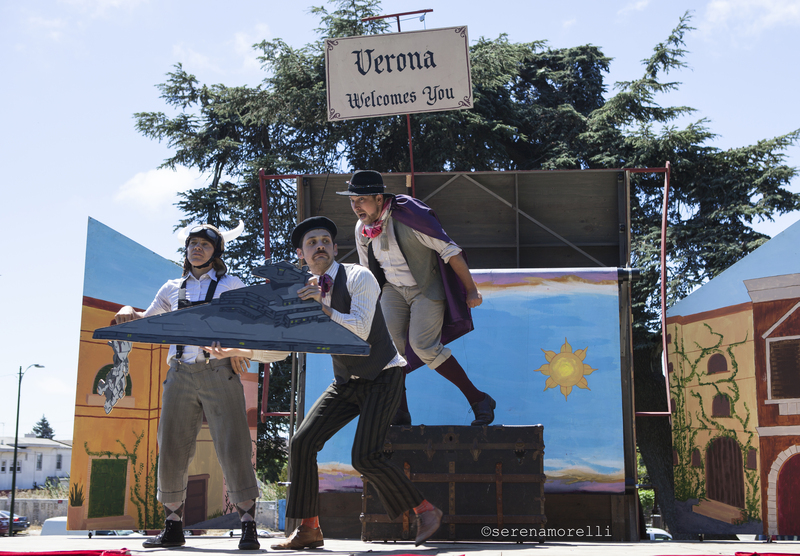 Photo by Serena Morelli.